I love Christmas. The whiff of Christmas tree stands, the promise of so many cookies, Love Actually on repeat. It can never come too soon in my opinion. So what should you be looking out for this year? 2 :: Visiting Santa at Macy’s. You meander past train sets and snow-covered penguins at SantaLand before meeting the man himself. It’s not just for kids! 3 :: Shopping at the Christmas markets. My favorite is the market at Union Square, but the Winter Village at Bryant Park is also worth a visit. 4 :: Christmas window displays. An annual tradition that’s executed ridiculously well. I loved Lord & Taylor’s last year, but for a full walking map see here. 5 :: Holiday Under the Stars is a cluster of star-shaped lights hanging in the mall at Columbus Circle and every evening from 5pm, they change colors to Christmas tunes. 6 :: The Nutcracker ballet at the Lincoln Center. I just went (blog post to follow…) and it is as magical as I’d hoped. A real Christmas treat. 7 :: Radio City Christmas Spectacular. 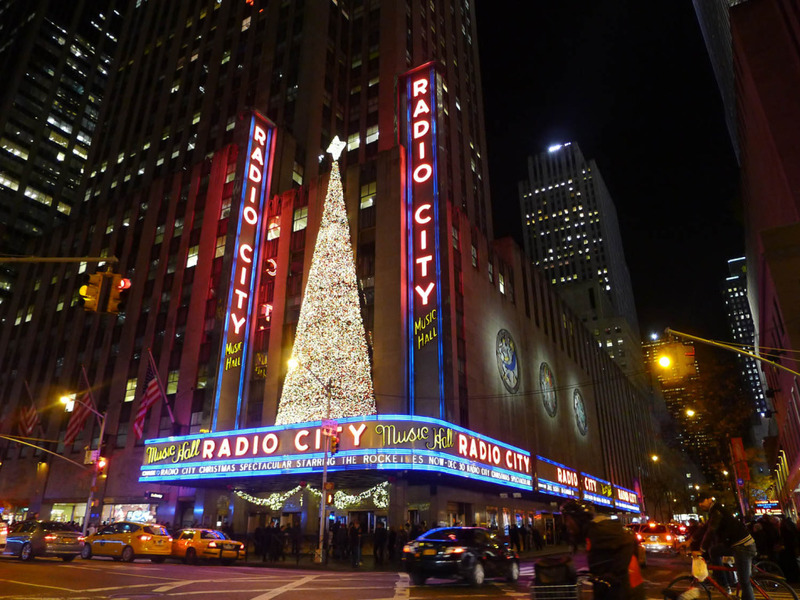 If you prefer high kicks to pirouettes, head to Radio City Music Hall instead. It’s very glitzy – and even features a real camel. 8 :: The Rockefeller Christmas Tree was lit last week and is best admired late at night when the crowds begin to wane. 9 :: Gingerbread Lane is a massive, entirely edible gingerbread village. It’s huge! Plus, it takes you to the Hall of Science – one of the city’s best museums. 1 :: The famed Origami Christmas Tree at the Natural History Museum. 2 :: A Christmas pop up bar at 649 East 9th St, which is serving cocktails such as ‘Three Wise Men’ (Calvados, gingerbread syrup, frankincense smoke) and ‘Bad Santa’ (rum, more rum, pineapple juice, milk, coconut). I heard about it here. 3 :: Washington Square Park tree lighting on Wednesday (December 10) at 6pm. I reckon it’ll be a slightly saner alternative to the Rockefeller’s Christmas tree lighting. 4 :: A marathon reading of Dickens’ ‘A Christmas Carol’ at the Housing Works Bookstore in SoHo. 5 :: The Christmas lights at Dyker Heights – where the residents of south Brooklyn try to out-do each other with massive light displays. The whole neighborhood must have blackout curtains. 6 :: Caroling on the steps of St Bart’s Church on December 15. I met St Nick there last year (pictured) but this year I’d love to arrive in time for a singalong. See here for other caroling spots. 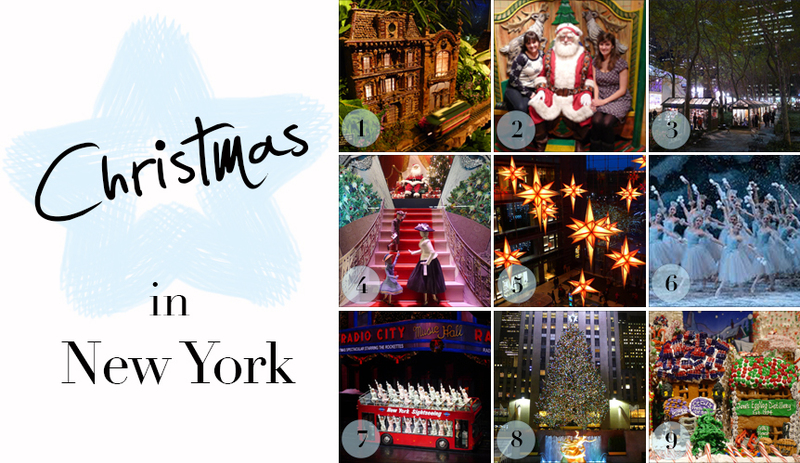 What are your favorite Christmas activities in the city? Let me know if there are any others I need to check out! Now, back to my eggnog. ‘Wish List’ photo credits: Origami, cocktail, Washington Square Park, Dickens and Dyker Heights. Design inspiration from C&C’s ‘Links I Love’. Well, thanks for reading :p I’m so excited about that pop-up too, the menu looks gooorgeous.